Reborn! Volume 1 contains episodes 1-101 from Seasons 1-4 of the anime directed by Kenichi Imaizumi in standard definition on two blu-ray discs. The tenth boss of the Vongola mafia family has been decided, and it's Japanese high school student Tsunayoshi Sawada! ...Also known as "Loser Tsuna." He's not smart, he's not athletic, and he's the furthest thing from cool. But the boys back in Sicily aren't about to let Tsuna stay that way. 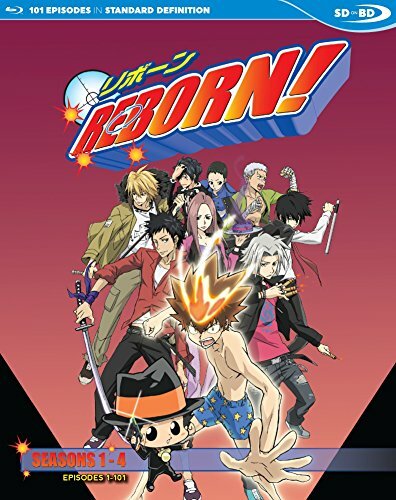 To make a man out of a boy, they send in the baby-the best hitman in the business, Reborn!In this collection, the daily life of Tsuna and the people he meets, fights, and grows to trust (amidst zany antics) are contrasted by the deadly battles brought on by arrival seeking to take the Vongola boss position for himself. Then, Tsuna is cast into the future, to deal with a threat that promises to end the Vongola for good. If you have any questions about this product by Discotek Media, contact us by completing and submitting the form below. If you are looking for a specif part number, please include it with your message.